GPS navigation app mapFactor Navigator for smartphones and tablets with Android, with voice guidance and detailed gps maps of Europe, USA, Canada or other countries. Details and installation of the mapFactor gps navigation app for Android are available at mapFactor Navigator page in Google Play. MapFactor Navigator is a free turn-by-turn GPS navigation app for Android with postcodes and free maps from OpenStreetMaps. These free maps and postcodes are installed on your device or SD card so you do not need an Internet connection when traveling. Free Maps are updated every month for FREE. Navigator Truck version includes route optimization for large vehicles based on vehicle height and weight. It avoids low bridges and narrow lanes. Avoid traffic problems with online traffic information. MapFactor GPS Navigation App is reviewed on Appliv. 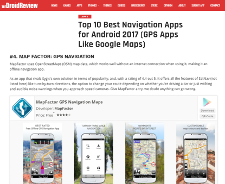 Navigator listed among the Top 10 Best Navigation Apps for Android 2017 in theDroidReview.com review.